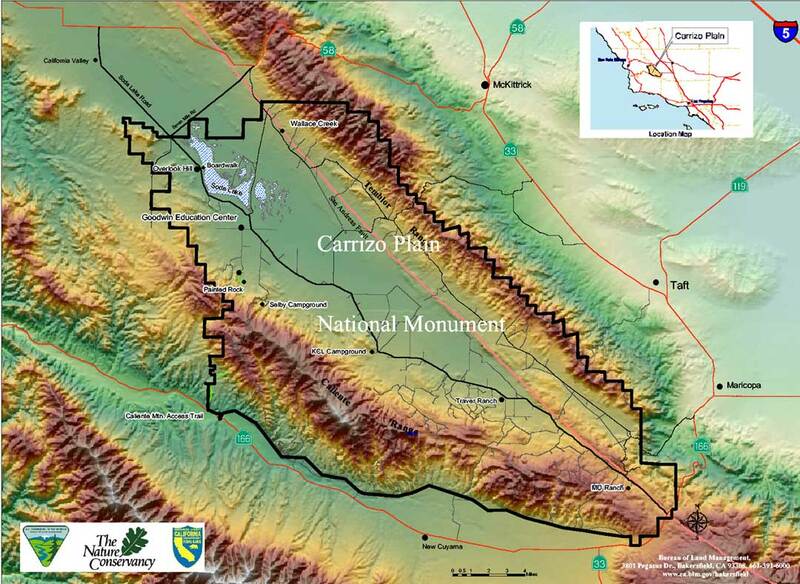 The Carrizo Plain has certainly not escaped California’s drought of recent years. Other than grass, the southern plain south of Soda Lake is almost devoid of plants, and we saw very few birds south of KCL Campground. Some Russian Thistle (aka tumbleweed) has returned, scattered amid the sage. 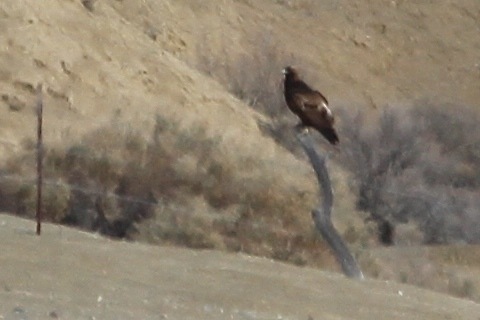 A Golden Eagle, perched far away in the company of two Common Ravens, was a significant exception. Almost 3″ of rain earlier in the week made driving a bit ‘iffy’ on the side roads, but it didn’t make new plants spring forth from the ground. The ground squirrel colony near the south end of Soda Lake Rd. had neither Burrowing Owls nor squirrels, as far as we could tell. 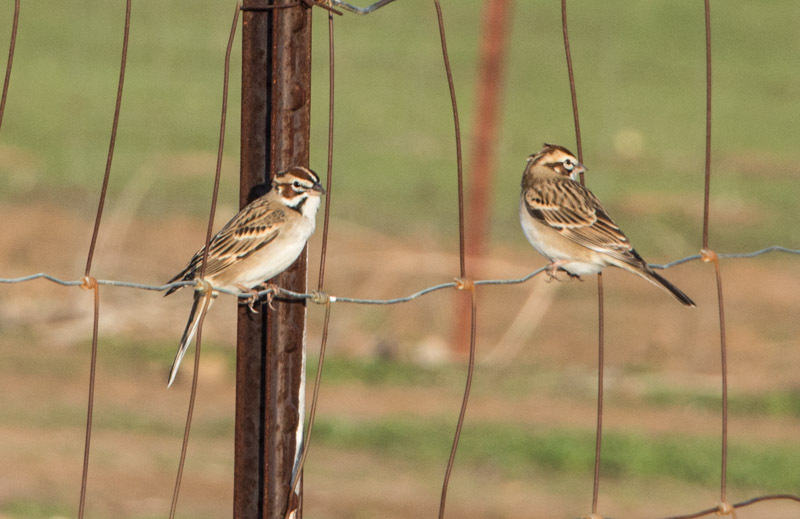 As we drove north we found several Loggerhead Shrikes perched on barb wire fences,a few Western Meadowlarks in song, Say’s Phoebes flycatching from the fenceposts and the usual House Finches near anything vaguely house-like. Beyond that, birding was sparse. 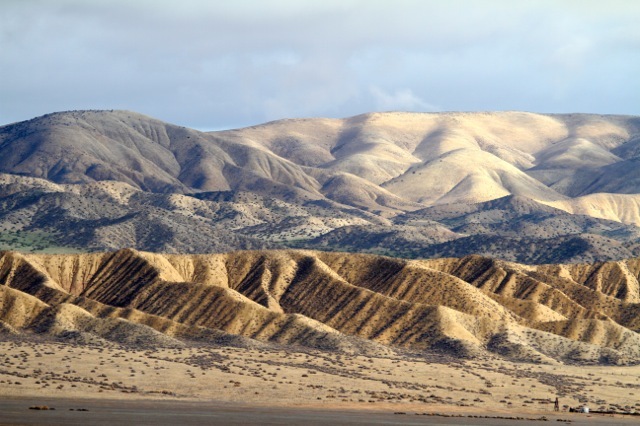 Van Metre Ranch, unmarked on most maps, is about 2 miles NNW of Traver Ranch. About 1 mile E of Traver Ranch a small road cuts off to the north, loops past Van Metre (3 miles), and loops back to Soda Lake Rd. about 1 mile NW of Traver Ranch. The day stayed cool and quiet. 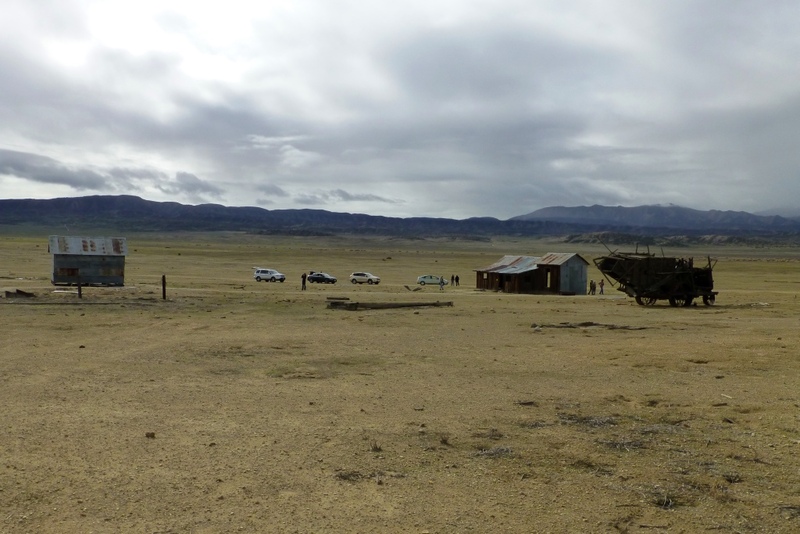 The 3 miles of side road to Van Metre Ranch were fine, save one muddy spot, and we explored the various buildings and ancient equipment at the ranch. Just past the ranch was a large muddy spot: I knew the muddiest area was still a mile away, so we retraced our route back to Soda Lake Rd. We then proceeded to Traver Ranch and its interesting display of farm equipment next to a bathroom, and – after watching a flock of bright blue Mountain Bluebirds flycatching – onward to KCL Campground where we had a very nice lunch with lots of cookies. Thanks Grace! 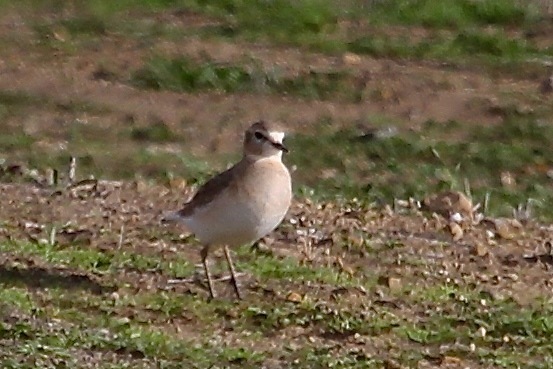 One car headed back home after lunch, and the birding picked up (no connection, I’m sure), starting with a large flock of Mountain Plovers, which we very cleverly discovered by nearly plowing into them when they wheeled across the road. Nearby, a flock of Long-billed Curlews wheeled around and around. I decided to skip both Panorama Rd., which cuts north across the plain, and Simmler Rd. at the south end of the lake. It was a Very Good Thing we did, as I learned shortly thereafter at the Goodwin Education Center: a young man, far too confident of his SUV and his driving prowess, had become seriously bogged on Simmler the previous day. Long after dark, after hours of walking and waiting and fretting, his vehicle was finally extracted from the mud, to the tune of $700. “There but for fortune, go you or I…” goes the song. 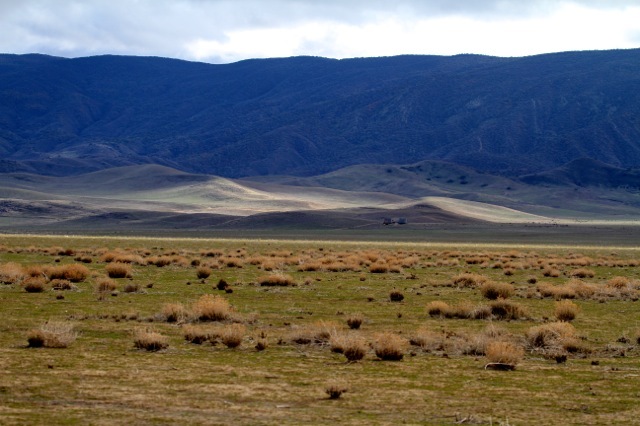 Near the Center, grazing on a rare patch of relative lush grass, was a scattered herd of about 150 Tule Elk. Alas, they were too far to photograph. Soda Lake held a lot of soda, as usual, and a bit of water, not so usual, but no Sandhill Cranes. Between the rarity of water in the lake and the absence of grain to glean in nearby fields, there has been little to attract or hold cranes in recent years. 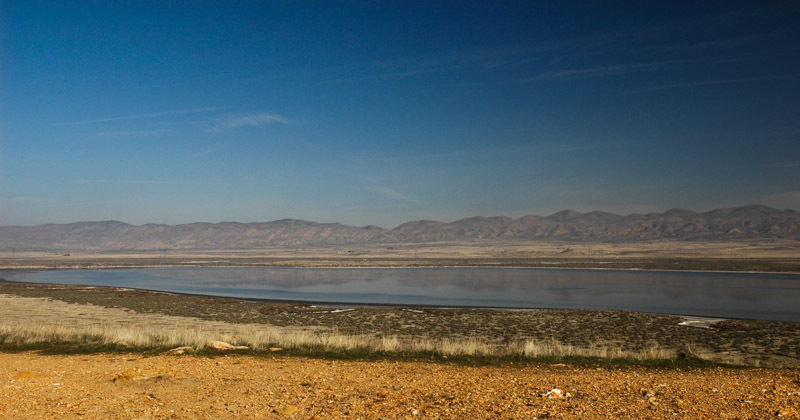 Tule Lake, beyond the Temblor Range to the north and into the southern San Joachin Valley, has become a far more reliable nighttime roost for the cranes. We found the unpaved roads within the small community of California Valley to be safe to drive, and the vegetation attracted birds, including a large roost of Eurasian Collared-Doves and a Merlin. 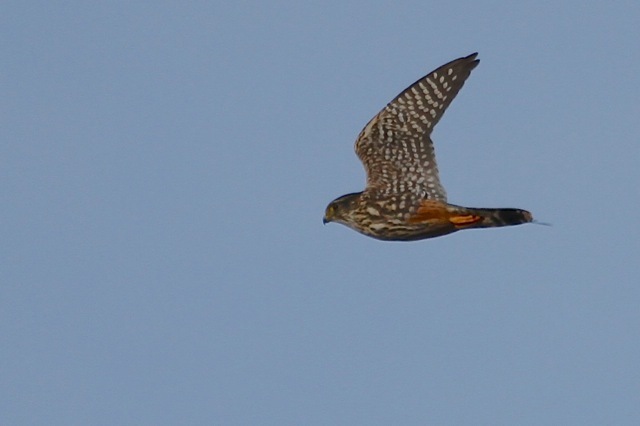 The latter pretended to be a Prairie Falcon for a few moments, but getting a better, closer look and then watching him fly revealed his true colors. The road to the San Andreas Earthquake Fault observation site was likely to be boggy, and none of us like the twisty and vomitous Hwy 58 route to McKittrick, so we headed home back down Soda Lake Rd. About half-way back to Hwy 166, we dimly saw two roadside figures, frantically waving their arms in our headlights. Skidding to a halt, we discovered them to be two young men whose car had died up a side road, well into the hills. Fortunately for them we had both room in our cars and inclination – despite their admitted hobby of hunting quail and dove – to give them a ride into Maricopa. Otherwise, they faced a 25-mile walk in pitch darkness and freezing temperatures. At Apu’s Kwiki-Mart they phoned their father, who volunteered – quite delighted, I’m sure – to drive over from Carpinteria, haul them home, and return the next day to fix their car. In the Carrizo, every day is an adventure. For those wishing to explore the Carrizo Plains, Morro Coast County Audubon now has an excellent 20-page birding guide. Love your trip reports and look forward to joining you on a future adventure. Any time. All trips are open to all people, although occasionally there’s a limit on number of cars.